Design: Holding function for Torx screws, chrome-plated, extra long blade to enable work on low-down, difficult to access screws. The 05028070001 Wera Kraftform Plus 367 HF Torx Extra Long Screwdriver is one of thousands of quality tooling products available from MRO Tools. Please browse Wera 300 Series Kraftform Plus Torx Screwdrivers for tools similar to the 05028070001 Wera Kraftform Plus 367 HF Torx Extra Long Screwdriver. 05028070001 Wera Kraftform Plus 367 HF Torx Extra Long Screwdriver description summary: Wera Kraftform Plus 367 HF Torx Extra Long Screwdriver. 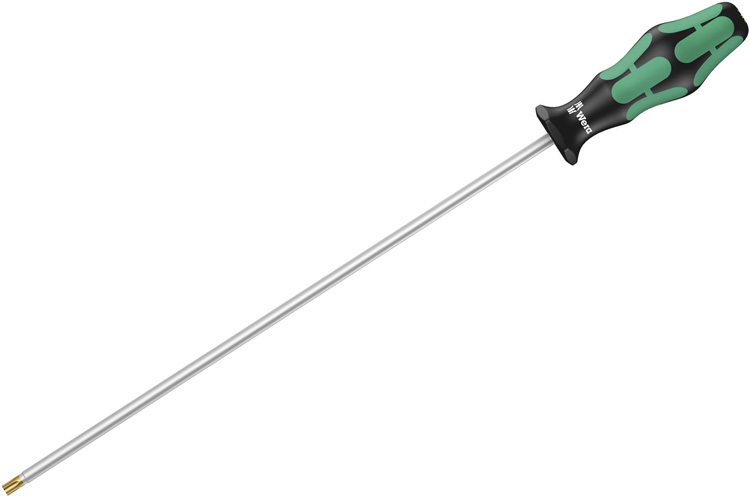 Point Size: TX 20 Shank Overall Length: 300mm / 12'' Handle Overall Length: 98mm Shank Diameter: 4.5mm Quantity discounts may be available for the 05028070001 Wera Kraftform Plus 367 HF Torx Extra Long Screwdriver. Please contact MRO Tools for details.